New Chop Check fluid section design. Pre-loads high viscosity material efficiently. Hardened Nitrotech rods & cylinder. Ideal for Syntactic style putties. Now better than ever with the all new Chop Check Fluid Section design, the Magnum Venus Products Putty Chop Check is the total solution for your putty needs. The Putty Chop Check is ideal for syntactic style putties and delivers superior pre-loading of high viscosity materials. The Putty Chop Check has been proven to increase production for large operations by reducing the amount of labor required to produce large parts by 1/3, and can cut production time in half. How? The Putty Chop Check provides only the amount of putty you need, reducing material waste normally encountered with hand mixing. No more pouring into the bucket and hand mixing, hoping you have the correct amount of catalyst. Maintenance is a breeze and its operating simplicity make it the operator’s choice for precise delivery of putty beads. Consistent metering and mixing can now be achieved at the gun for easy use and efficient productivity. NEW! 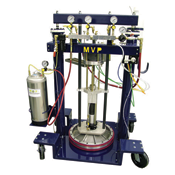 The Putty Chop Check unit now features hardened nitrotech rods and a hardened cylinder. Famous high quality MVP durable components are integral throughout. Safety override valves are standard on all units. Pour: approximately 2 lb.- 25 lb./min. Catalyst: 0.75% to 3% by vol.